This week I (Vilya) have finally started working on Puzzle World, the small extension of Tai Ming’s second zone set in the north! It’s been a blast – but first, let’s take a look at something I forgot: the Giant Thorn-Worm boss portrait! Based on Fred’s sprite, the Giant Thorn-Worm boss portrait is pretty straight forward, as it’s.. well, just a worm. Of course, it had to be adjusted in some ways: for one, it needed to be a lot longer than it is in the sprite, or it’d barely reach above the title text! I also added a few more spikes to its back. Other than that, I tried to stay true to the sprite. Perhaps I could have added some texture to its skin, and maybe I will at a later stage – but I think it’s important that the boss portrait resembles the actual sprite as much as possible, especially when the sprite is as big as the Giant Thorn-Worm is. 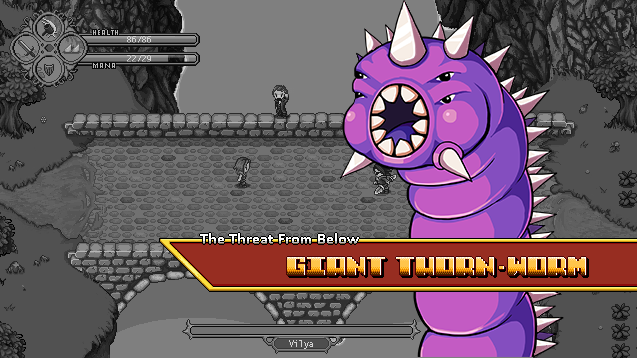 As for the boss title itself, the main title will be “Giant Thorn-Worm”, with “The Threat from Below” as its sub-title. This is actually a reference to the movie Tremors, which was known as “Hotet från Underjorden” (The Threat From Below/the Underground) when it came to Sweden! And now…. It’s time to begin! 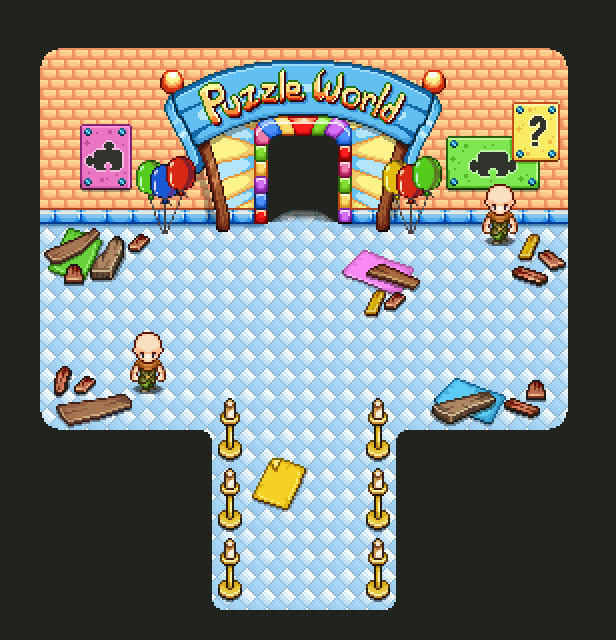 Using the sketches from last week, I’m going to create the backgrounds for each of the Puzzle World rooms. 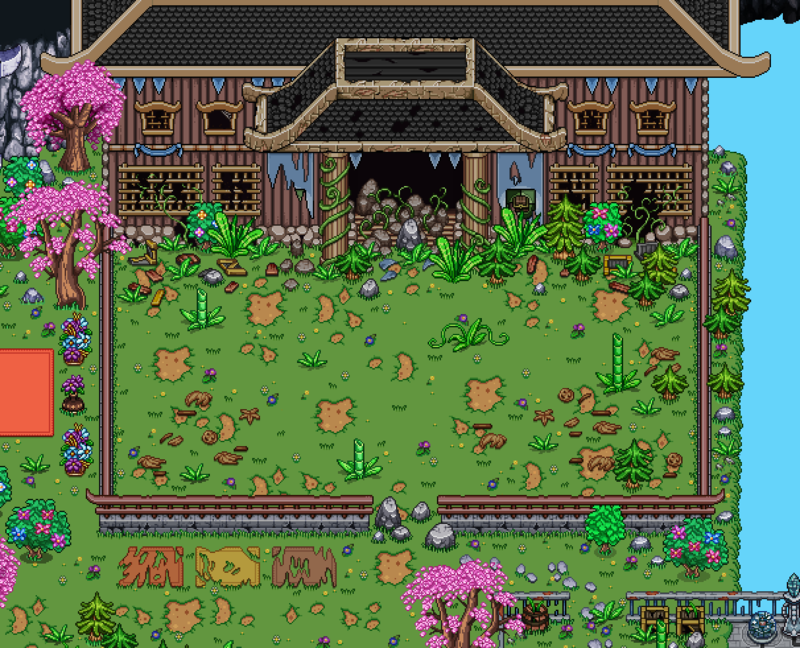 It’s gonna be a lot of fun, since this place will be totally different from everything else in Tai Ming graphics wise: bright colors and crazy color combinations everywhere! Wohoo! Next. adding some balloons. I mean, it’s a theme park, after all – so it’s not really complete without a few balloons. Right? A step-by-step GIF of the design! Since most of the wall and floor stuff has been made already, there’s a lot less to do in this room. The banners are actually reused from the HQ (though resized and remade just a tiny bit), while the pillars and the puzzle parts on the floor had to be made from scratch. These puzzle blocks are made in wood and are supposed to be based on the ‘real’ puzzle blocks you find out and about in the world of Grindea. However, I chose to make these in wood so that when you travel to the present to fight enemies, there aren’t a bunch of puzzle blocks blocking your way as you battle – they have decayed and only planks will be left on the floor, which have no colliders. Since the second zone has become quite big and advanced, we agreed that it’s best to keep the third zone smaller and a lot more straight forward, in order to pace things well. When you first enter this zone, you will see a weird celebration and a bunch of strange things happening in front of a lot of people outside an ancient shrine! I know I’m vague, but it’s gonna be really cool if we get it right! Next, you’ll be sent back to the present, where you’ll make your way through the shrine itself. Here you’ll be sent back and forth in time seemingly randomly – the time warp thing has gone crazy it seems! There will be some battles and some cutscenes explaining what’s happening next, and things are getting quite scary..! I quit making the second zone’s outdoor transition from past to present around the HQ, as we hadn’t decided if the area needed to become bigger to properly house the Giant Thorn-Worm battle. Since we decided to keep things as they are, it was finally time to get a move on and finish things up! In the end, I also had to add a ton of stuff in the editor to serve as colliders: this part of the area will be blocked unless you get here from the right time rift. Right not some of the items aren’t correctly sorted, but they will be once the game engine does its work! 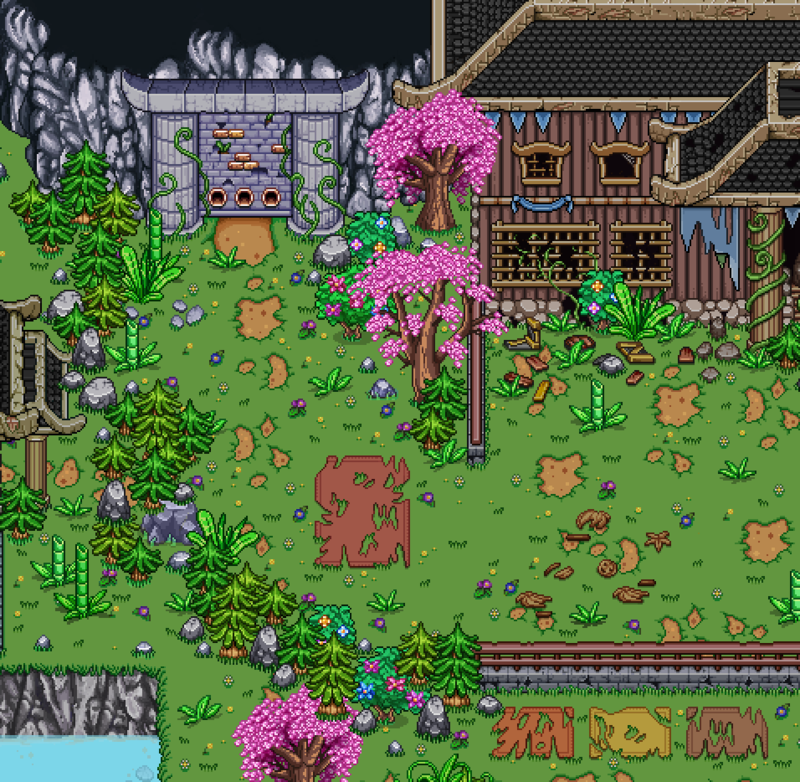 Meanwhile, Fred has been busy filling this area with the NPCs living here! 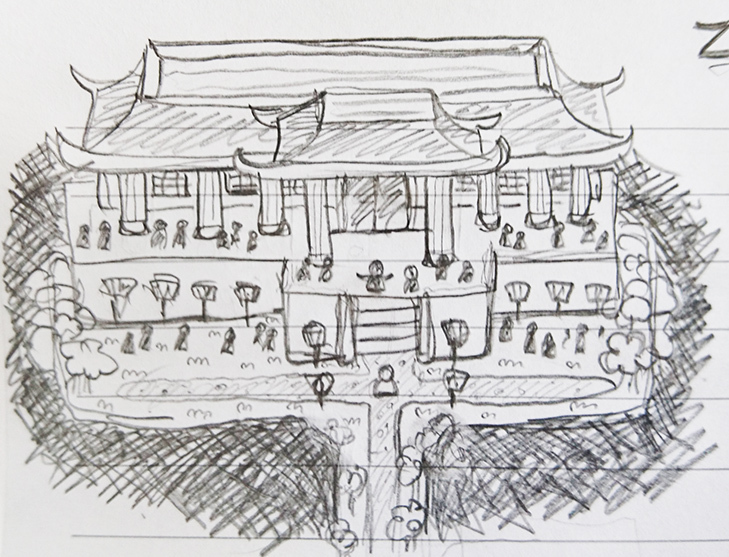 Tai Ming has attracted all kinds of people, ranging from collectors, priests, merchants and bar owners! Some might resemble characters from the present: distant relatives, perhaps? Now that I’m finished with my share of the Tai Ming 2nd zone backgrounds, it’s time to move on to something different: the puzzle cave in the north part of the map! 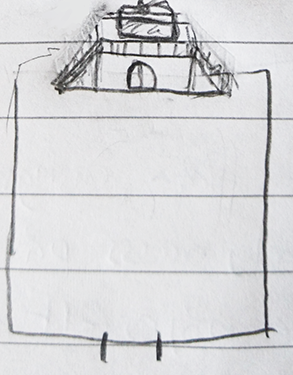 We’ve actually made a very basic sketch of the area, which includes all the rooms and what you’ll face there. 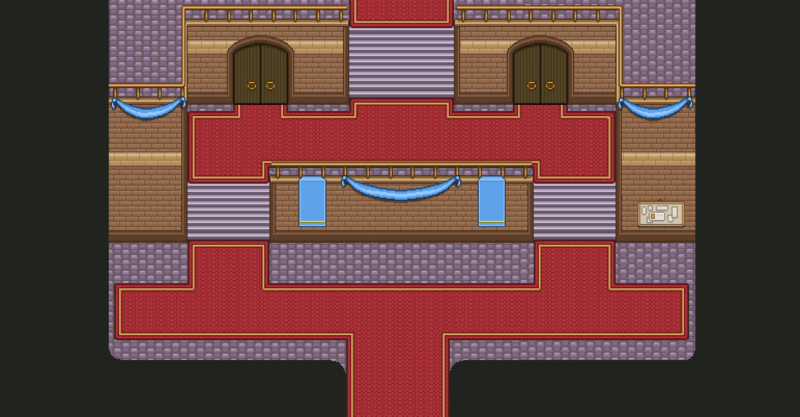 I already mentioned the rooms in a previous post, but now we’ve actually designed the rooms! 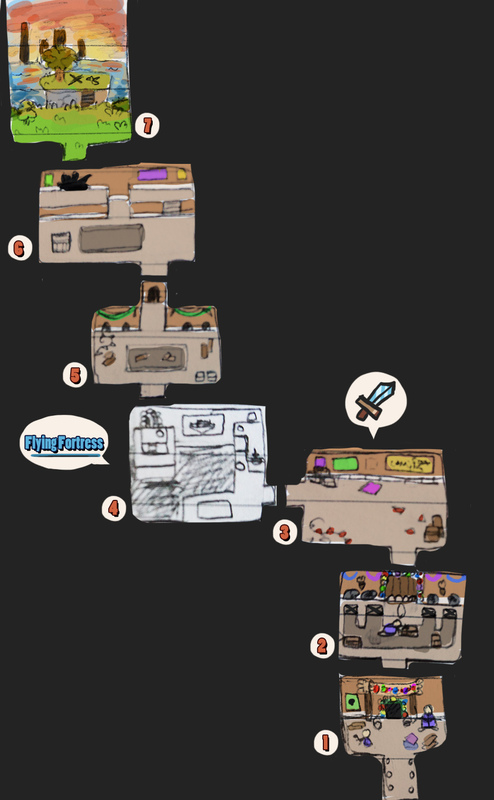 The sketches above are very messy and basic, but they show in which order the rooms will appear, as well as and approximation of how they’ll look. 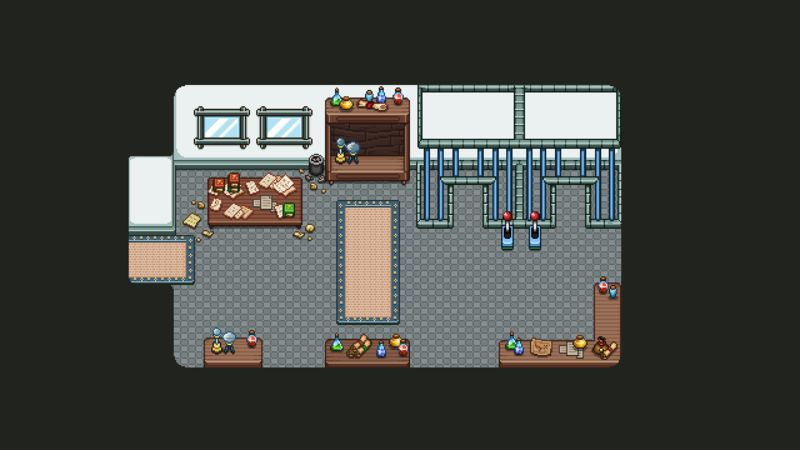 Room 1 is an introduction room where you’ll meet the owner of the amusement park and his workers. 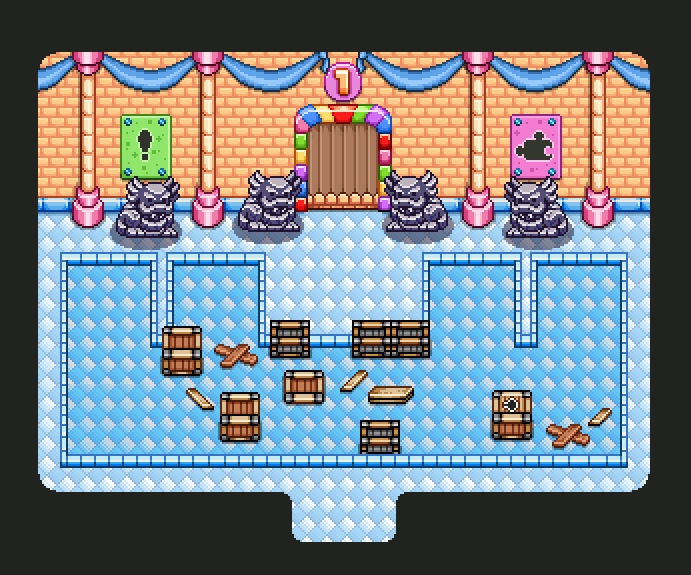 Room 2 is the Ancient Statue Puzzle, where you’ll have to use statues get to Room 3, where regular battles will take place. 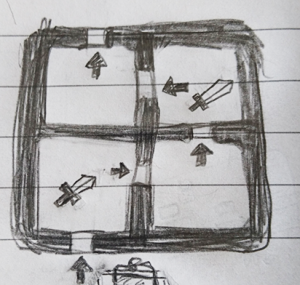 Room 4 is sponsored by Flying Fortress and features a Phase Shift puzzle (shown here), Room 5 is where the Monkey Madness takes place, and Room 6 is the “Path Puzzle” shown in the same post as the Phase Shift puzzle. Before designing this place, I (Vilya) had a talk with Fred and Teddy about what level of technology we wanted this place to have. We had plenty of options: we could either go full Flying Fortress style with lasers and very high technology, or we could go more primitive and ancient-oriented. Since we wanted this area to feel quite modern for Tai Ming (making it stand out and all), we decided to keep it kind of high-tech, but not Flying Fortress laser-level. 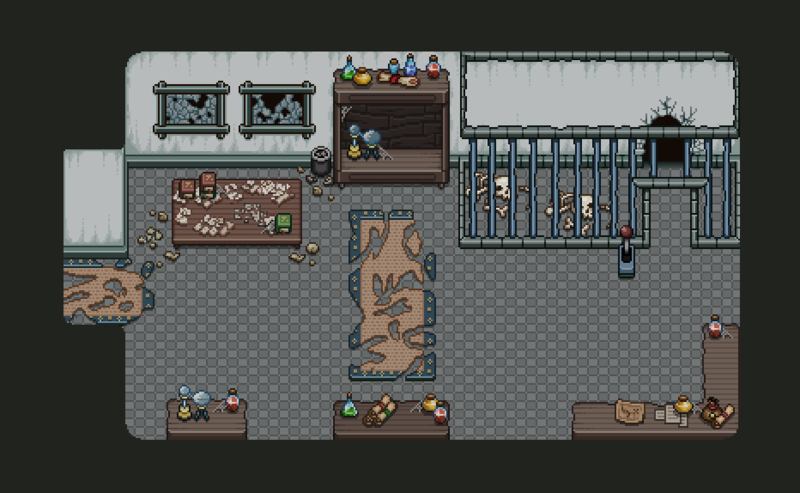 So there’s steel bars, lots of documentation, some glass vials and strange potions, some which will be animated and added later on by Fred! 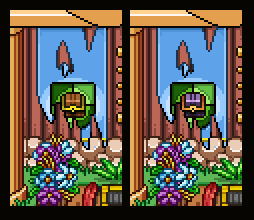 Just for fun and some flavor, an optional chest has appeared in Tai Ming’s present state, as well! But however will you be able to reach it with all the rocks blocking the way? Those of you who paid attention to the text screens in the Phase Puzzle course in Mount Bloom should be familiar with Tonee, who wrote about the course in some detail! After getting back from some days off, it’s only natural that you (or your team) have thought about a bunch of small improvements that could be made! So, after getting back last week, Vilya got straight back into fixing a bunch of things in Tai Ming’s second zone! 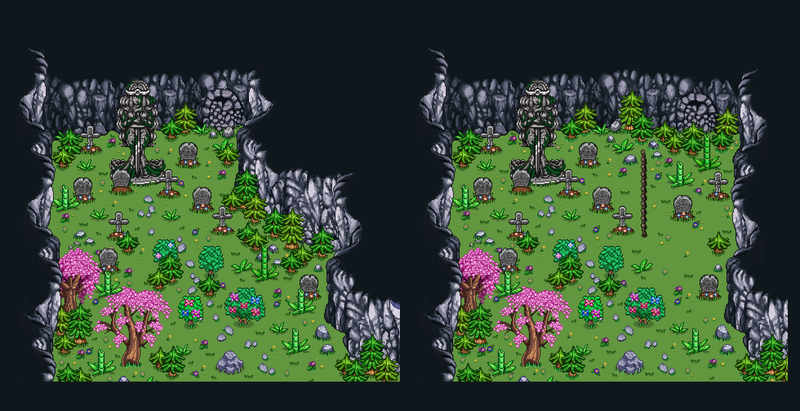 Since this cave will be a puzzle cave, we thought it’d be a little bit funny if it was next to the graveyard, in order to illustrate how poor the owner’s business choices are. But we found it got a little bit too crowded, so we decided to move the entrance further to the right, and add a small fence to illustrate the end of the graveyard. We’re considering editing the doors a bit so they’ll fit in better with the Tai Ming theme. Also, there will be guards placed outside the doors like in Evergrind City, so you won’t be able to enter (though I guess it’s kind of rare to be able to walk through closed doors in this game anyway). The doors are only there to make the place seem bigger than it is, really! When making this portrait we used the guard portrait as a base and recolored and repainted where needed, to make them look similar enough to be related.